Dry-Wipe Pen and Eraser included. This A4 letter formation whiteboard set is a double-sided whiteboard (plain on reverse) which shows the starting point and direction for the correct formation of each letter. 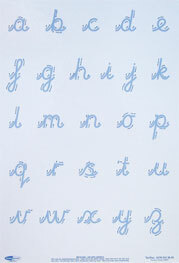 A great learning support tool for learning and practising cursive handwriting. Includes: 1 x Cursive Letter Formation Whiteboard, 1x Dry-wipe pen and 1x Eraser. Write & Wipe resource for learning correct letter formation.